My 8-year old has empty nest syndrome. Yes, you read that correctly. And I mean that in a rather literal sense. You see, those four hatched baby robins I mentioned just two weeks ago in Signs of Spring are gone already. The birds grew quickly, and the last one just flew away on Saturday. We had a special vantage point for that nest. We could sit at our kitchen table and peek out the window to see the nest from behind. We could watch it in safety without scaring the mother away, and we built a little bond with those birds. We got excited when she laid her eggs. We were even more excited when they hatched. We could see the mother bring worms and watch the babies’ scrawny little beaks reach up to grab their food. We watched as they got bigger and the nest became more crowded. The first one left as early as this past Tuesday. We found him on the patio and walked far around so as not to disturb him or leave our scent on him. We watched to see if he was hurt or just waiting, and soon enough, he flew away on his own. Then we watched as the others got bolder and started inching out along the drainpipe, flapping their wings as they still sat in safety. Then finally on Saturday, the last one got his courage and flew across the yard to the forsythia bush. We all cheered. It was a thrilling moment. And then it hit us- they’re gone. Our 8-year old started to cry, and I’m not gonna lie to ya, I was a bit teary-eyed myself. The nest is empty now; abandoned. It’s a lonely feeling. And those birds provided us with a microcosm of life. I know some of you reading this are “empty nesters.” I’m not there yet. My kids are still young. I won’t presume to pretend I know what it feels like to have my kids grow up and leave the house. But everyone knows that time flies. Even parents of a baby just turning 1 will say, “Where did this year go? How is it even possible that she’s already a year old? It feels like we just brought her home from the hospital!” I see that myself. I look at my oldest and wonder how it’s possible he’s already in double digits. As he grows up and becomes more independent, it’s both thrilling and bittersweet, like our birds learning to fly. Yes, we rejoice that our kids are able to do things for themselves, but with each milestone they reach they need us a little less. My oldest is more aware of the world in which we live, which means he’s losing some of that sweet innocence of childhood, and again, that’s bittersweet. I do want them to grow up and be responsible adults eventually, but then again, maybe not so fast. Someone once told me that to love is to risk loss. Spouses love each other knowing that one of them will likely die before the other. Parents love their children knowing eventually those children will grow up and move out. Children love their parents knowing they will probably have to bury their parents someday. Friendships made in grade school and high school and even college usually don’t last forever. Even close friends from college often move away and fall out of touch outside of the Christmas card exchange. Job transfers and other opportunities cause families to move and leave behind friends and family. Goodbyes are painful. And the more you love a person, the harder it is to say goodbye. I know this personally. I’ve moved several times in my adult life, and two of those times were especially painful because I had to leave behind a dear friend in both of those moves. Yes, we still keep in touch, but it’s not the same as meeting for a cup of coffee or taking a picnic to the park together. To love is to risk loss. What lesson can we learn from those birds, then? Take advantage of the here and now. I know life is crazy busy. And in this technology-driven society, it’s easier than ever to isolate ourselves and block out everyone else. But cherish the relationships in your life while you have them. Go out on a real date with your spouse: no kids allowed. Leave your phones in the car and go somewhere that doesn’t have TVs on every wall so you can actually have a face-to-face conversation. Make time to spend with each of your children one-on-one. Get creative. Go for a walk each night with a different child or take each one out individually for ice cream over the course of a few days. Make time for them while they’re still in your “nest.” They’ll fly away soon enough, but for now enjoy your time with them. Make arrangements with a friend to meet for coffee or a playdate in the park. Call your long-distance friend for a chat. Nurture the relationships you have right now. 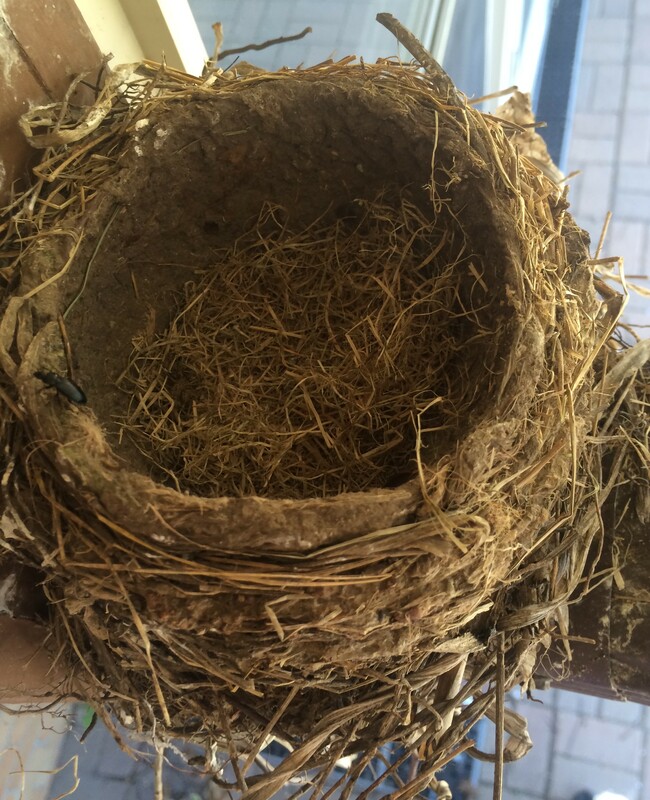 At some point we will all have our own version of “empty nest syndrome,” whether it’s our kids leaving home, the death of a spouse or other close family member, or the loss of a friendship. It’s a lonely feeling. But the loneliness is a sign that you loved. And you may be lonely, but you aren’t empty, because your heart is full of the memories you shared. Our baby birds aren’t in their nest anymore, but we can still hear them. Just step into our backyard and you can hear birds chirping in surround sound. It sounds like an aviary out there. They’re reminding us that even though they’re out of the nest, they’re still around. It’s different, yes, but still nice. And your relationships may change outwardly, but provide new facets and opportunities as well. Cherish your relationships and love boldly in the here and now. Love is worth it.